Occasionally with all wireless Internet radios, media players, smart television, et al, you’ll likely need to switch them over to a different wireless Wi-Fi network. Either your current router has worn out (stopped broadcasting the Wi-Fi network signals), or you’ve replaced it with a new and improved wireless router that is using a different Wi-Fi name (SSID). In either case, you must reconfigure all your wireless devices to connect with the new network. In this scenario, we illustrate with pictures, how to update the current Wi-Fi network on the Sangean WFR-20 Internet Radio. 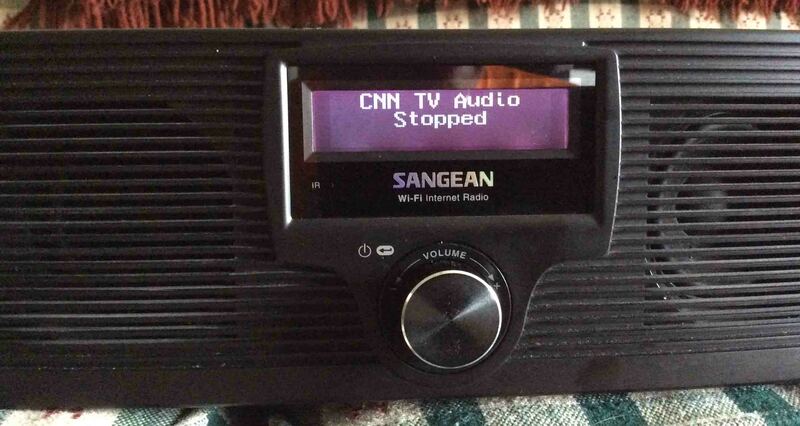 Here’s what this Sangean radio looks like, in the Standby or OFF position. This display does not change even if the wireless network to which this radio is connected, is deactivated. Sangean WFR-20 Wi-Fi Internet Radio and Network Music Player, Front View. You take it into your heart to listen to some Internet stations from around the globe. So you turn on the Sangean by rapidly pressing and releasing the knob. The “Initialising network” message appears briefly, as shown next. 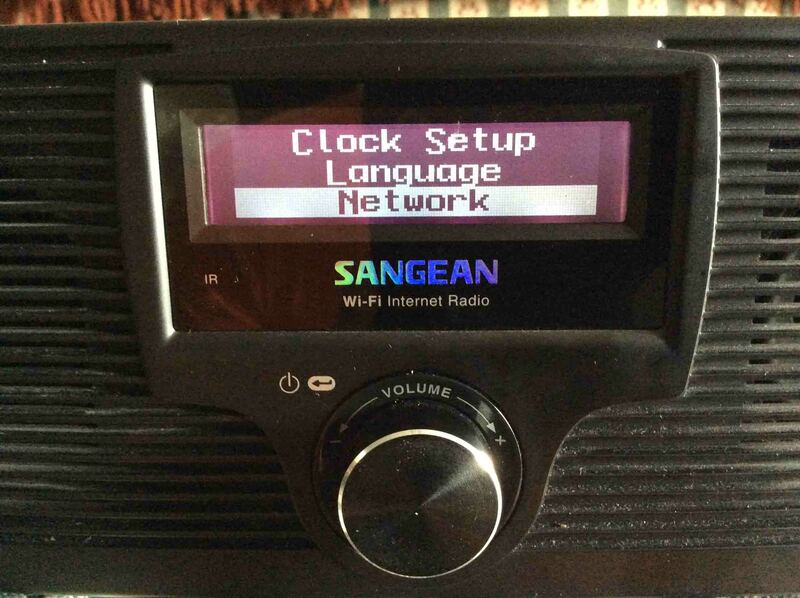 Sangean WFR-20 Internet Radio, displaying the Initialising Network Screen. 2. Wait while the WFR-20 attempts to connect to the “old” network. After some seconds, the Sangean attempts to connect to “the old” Wi-Fi network, and the screen changes to show this. In our case, the originally configured network name is NETGEAR61. The connection attempt is shown next, as the radio displays the “Connecting to NETGEAR61” message with the little spinning line at the bottom of the screen. Sangean WFR-20, trying to Connect to Saved Wi-Fi Network NETGEAR61. 3. Look for signs that the connection attempt has failed. Normally, if the NETGEAR61 network is functioning, the radio connects successfully to it within several seconds of issuing the “Connecting to NETGEAR61” message shown above. 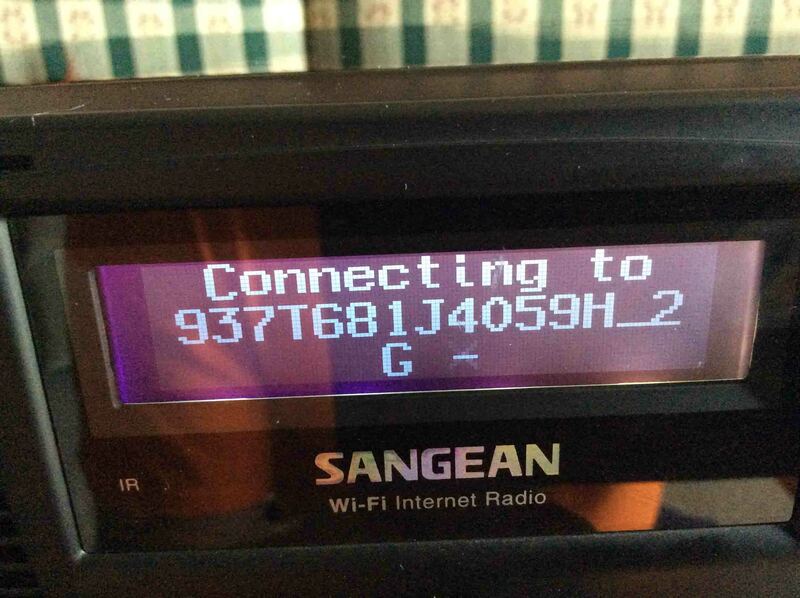 However, the Sangean does not give a clear message when it fails to connect. The radio might just display the “Internet Radio” message. Or it might display the last Internet station you successfully played, but with the word, “Stopped,” just beneath the station description line, shown below. The radio may also take you directly to the “Scan for networks” menu item. In our scenario here, we had been listening to Cable News Network’s “CNN TV Audio” stream that last time we played this radio. 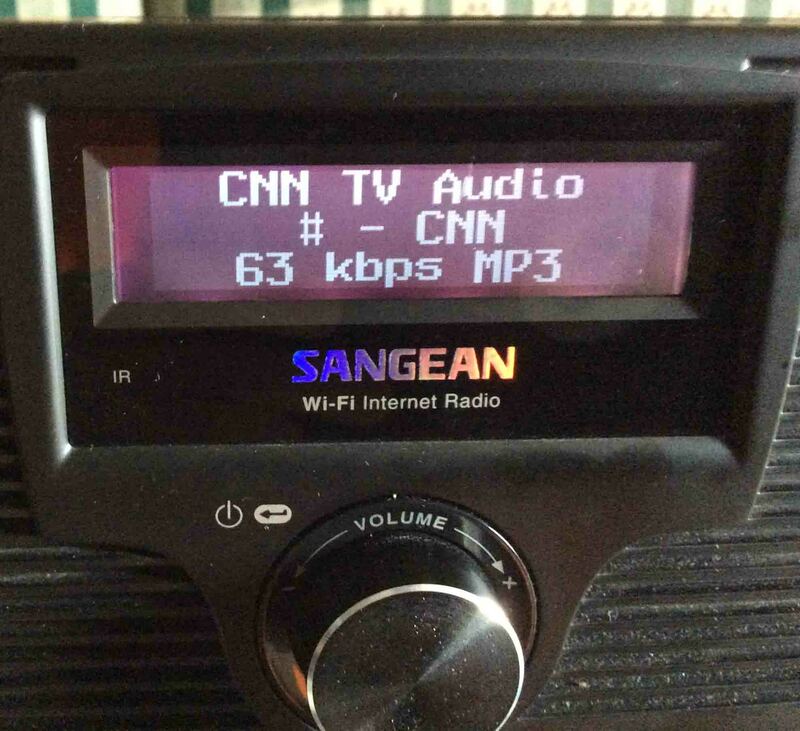 The radio will automatically pull up CNN again, after we’ve finished entering the updated network information. For that, see step 13 below. Sangean WFR-20, Displaying the -Internet Station Stopped- Message. 4. Pull up the Mode menu. From most every screen on this radio, including the “Internet Radio” or the “Stopped” messages, you can reach the Mode menu by pressing and holding in the knob. After a couple seconds, the first few items on the Mode menu appear on the screen. 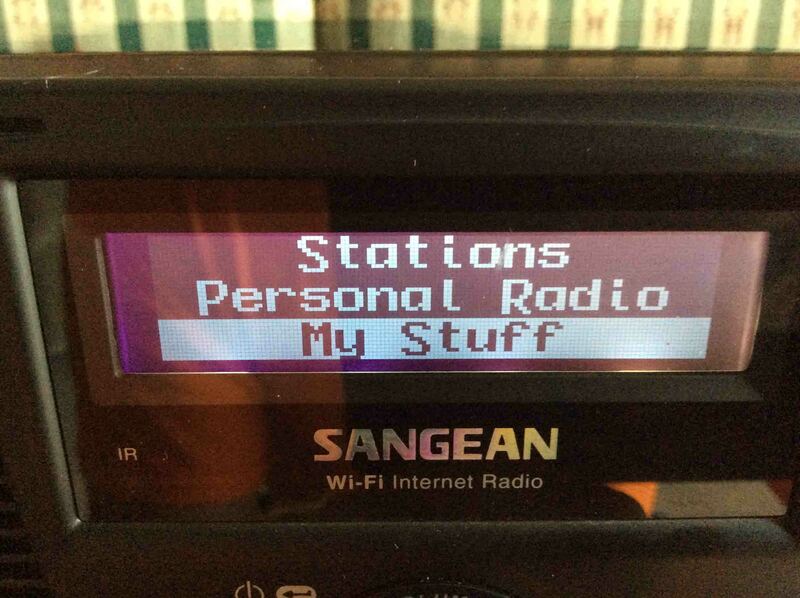 They are: Stations, Personal Radio, and My Stuff. Note that the currently selected menu item appears in reverse video (black on white) style. Sangean WFR-20 Wi-Fi Internet Radio, displaying its Main menu. 5. Navigate to the Configure menu item. On the Mode menu, turn the knob to the right, until you see the Configuration menu item, as shown next. 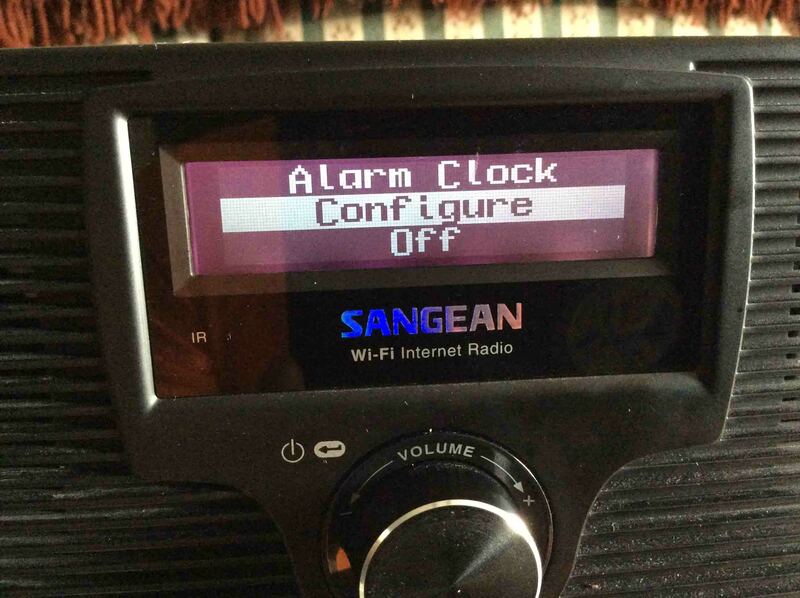 Sangean WFR-20 Wi-Fi Radio, displaying its Configure menu Item on the Mode menu. 6. Enter the Configure menu. With the Configure menu item highlighted, press the knob. This takes you into the Configure menu proper, as displayed next. The first three items on this menu are: Aux Input Level, Backlight, and Clock Setup. 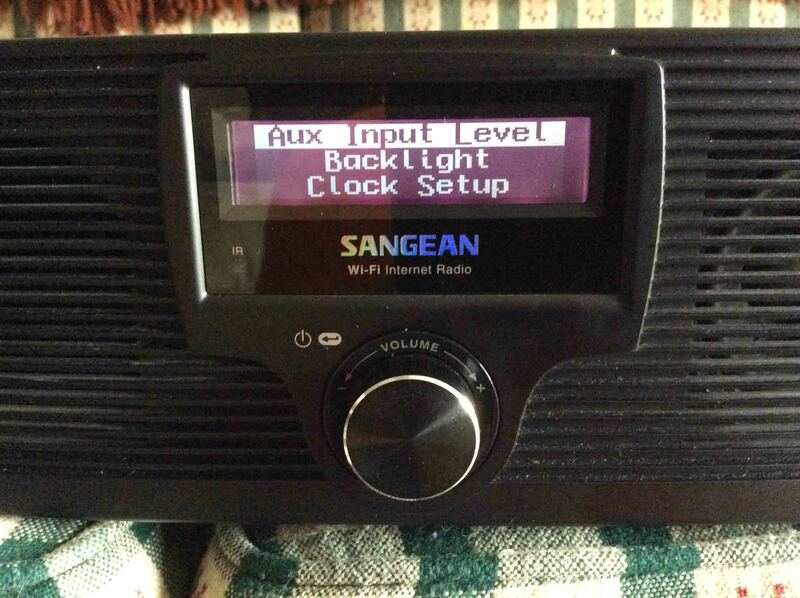 Sangean WFR-20 Internet Radio, displaying its Configure menu. 7. Navigate to the Network menu item in the Configure menu. Turn the knob to the right, to scroll down through the Configure menu, until you highlight the Network menu item, as shown next. Sangean WFR-20 Radio, Displaying the Network Item in the Configure Menu. 8. Go into the Network set up menu. With the Network menu item selected / highlighted, press and release the knob. The Network setup menu is then displayed on the screen as follows. The first three items in this menu are: Scan for networks, Enter network name, and View Config. Sangean WFR-20 Radio, displaying the Network setup menu. 9. Initiate a band scan for all in-range wireless b/g networks. The “Scan for Networks” item is selected by default, as pictured above. So, initiate a scan for all in-range Wi-Fi networks by pressing and releasing the knob quickly. Note that this radio only scans on the 2.4 Ghz. wireless band. So any 5 Ghz. networks you are running will not display on the WFR-20. The screen showing the scan in progress displays, with a progress bar, that slowly fills in from left to right. Sangean WFR-20 Radio, Scanning For Wireless Networks Screen. After several seconds, after the progress bar reaches the right edge of the display, the Wi-Fi scan is complete, and the WFR-20 then presents a list of in-range wireless networks that it found, as shown next. We’re going to connect with the 937T681J4059H_2G network. This list appears to be sorted, based on Wi-Fi strength of each network. So, our network appears at the top of the list and is already selected. If your network is not selected, turn the knob until it is. Note that the radio may not always find your network on the first scan. If not, initiate a new scan by scrolling with the knob to the bottom of the network list, select the “Back” item, and press and release the knob. This takes you back to the screen displayed in Step 8. Initiate a new scan by then repeating this step from the top. 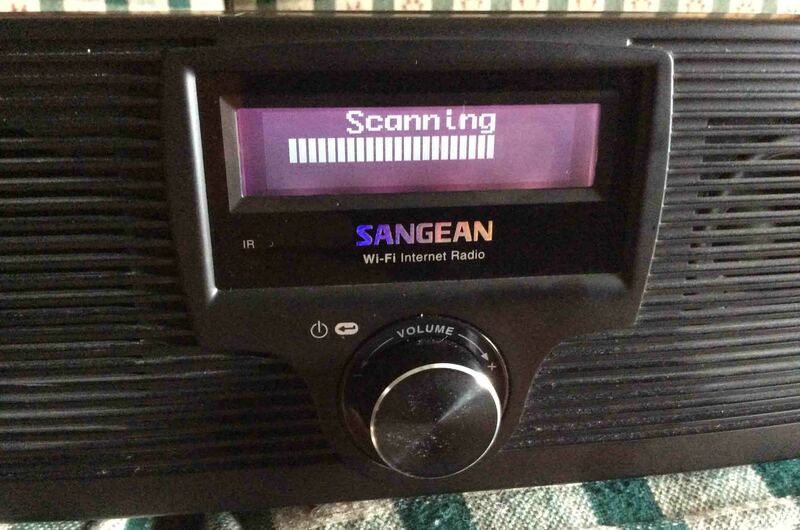 Sangean WFR-20 Wi-Fi Radio, showing in-range networks screen after Wi-Fi scan. 10. Choose the desired Wi-Fi network. Once you have the desired network selected, press and quickly release the knob. If the selected Wi-Fi network is “open,” and does not require a password, the radio will immediately connect to it. However, since we’re sure that ALL your networks are secured (hint hint), the radio will prompt you for a password by displaying the following screen briefly. 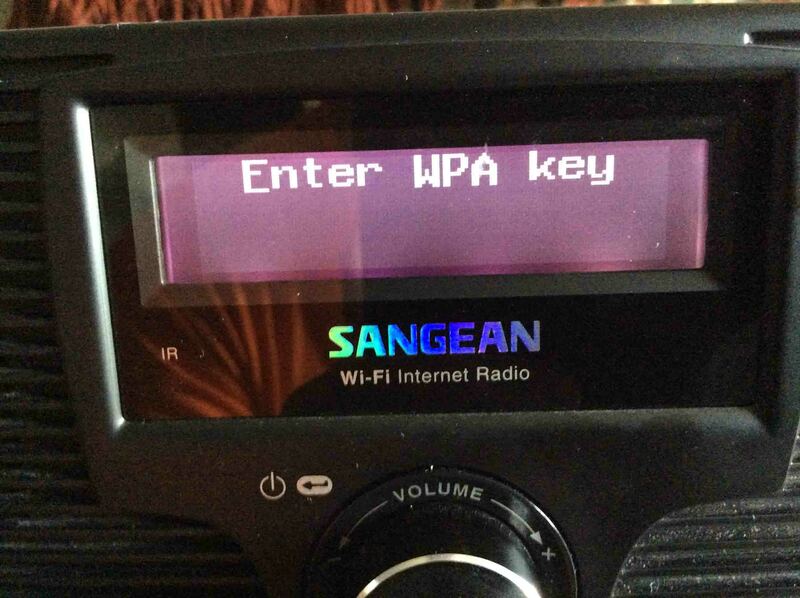 Sangean WFR-20 Player, displaying the Enter Wireless Network Key screen. After a few seconds, the radio displays the password entry screen, as follows. This is a single line field editor. The middle line shows the currently-selected character. In this case, A. And, it shows characters to the left and to the right. 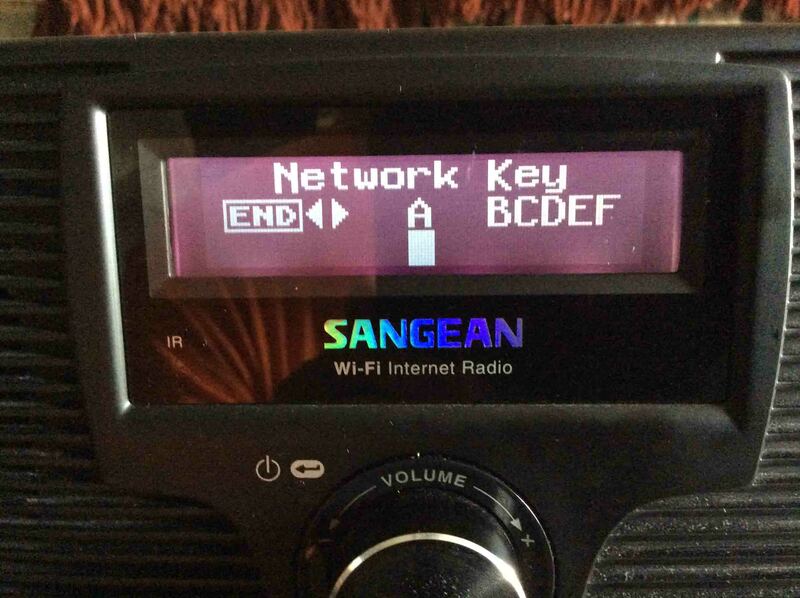 Sangean WFR-20 Radio, Displaying the Network Key Entry Screen. 11. Enter the network password characters. On the screen above, you are being prompted for the password of the wireless network you selected in step 9 above. So, for each character, rotate the knob left or right to scroll through the available characters list. When the desired character lines up in the center of the screen, quickly press and release the knob. This enters the character into the password field buffer, which is displayed on the bottom of the screen. Then, rotate the knob to find the next character, and press it quickly when you do. Repeat this until you’ve entered the complete password, which will look something like the following screen shot. How to use this simple editor? Pressing and releasing the knob quickly enters the selected character. If the selected character is a left or right pointing arrow, the insertion point, the cursor, is moved one position left or right in the password field so that you can enter more characters in the middle of the password if so desired. Pressing and holding the knob for a second or two, moves the insertion point one position left and erases the current character. You may have to practice with this admittedly awkward character entry interface a bit until you become adept at it. We’ve blurred some of the characters to keep the password secure. Once you’ve entered all your password characters, find the END character, as also shown next, and position it in the center of the screen. This “character,” is akin to the Enter key on a conventional typewriter style keyboard. 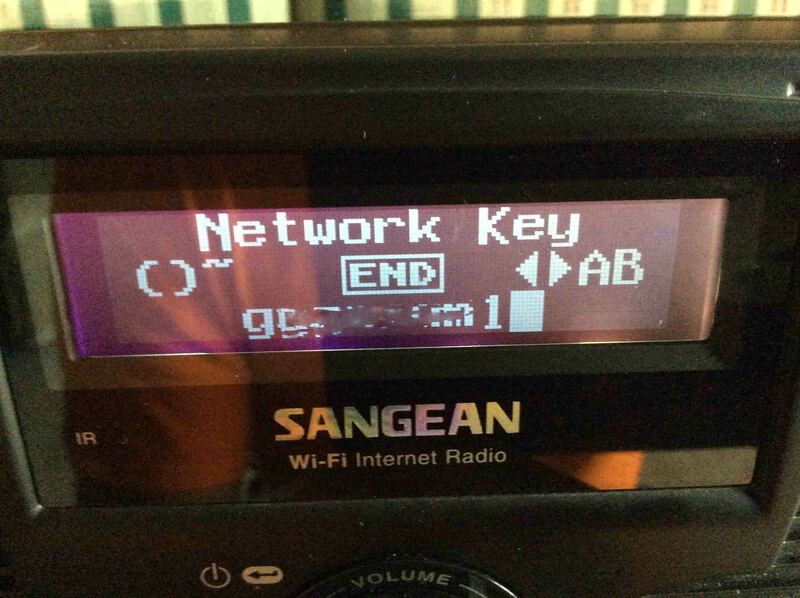 Sangean WFR-20, displaying the Network Key screen, with a password entered. Note that the password characters have been blurred for security purposes. 12. Accept the entered password key. Press and quickly release the knob when your password correctly appears on the screen in the editor buffer, and you’ve selected the END character as the next character to enter. 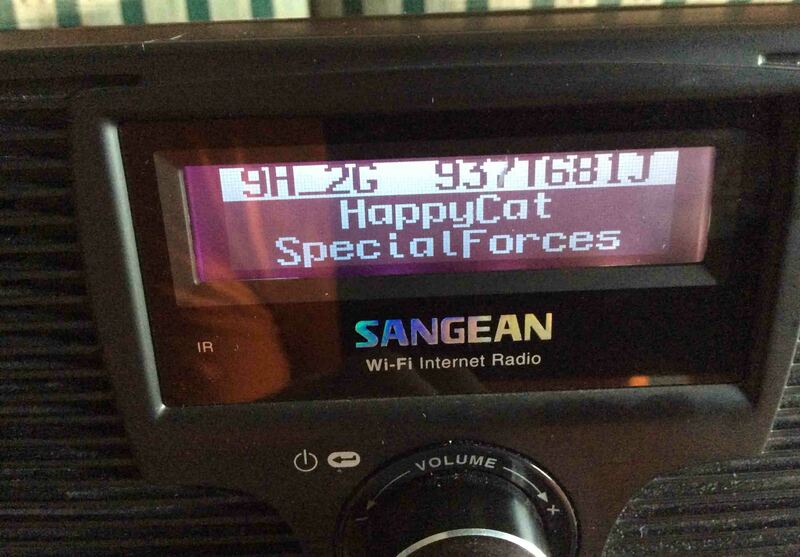 The following screen appears, as the radio attempts to connect to the new Wi-Fi network. Sangean WFR-20 Radio, connecting to selected Wi-Fi network. 13. Play the radio on the new network. If the password you entered is correct, the radio takes you back to either the Mode menu as shown in step 4 above, or it will play the station you last listened to successfully. Note that the radio may reboot if this is the first network you’ve connected to after doing a Factory Reset. Fear not. The network you just programmed in is not lost, and the radio will connect to it using the information you entered, after the reboot completes. Sangean WFR-20 Radio, playing Internet station after successful Wi-Fi network connection is established. 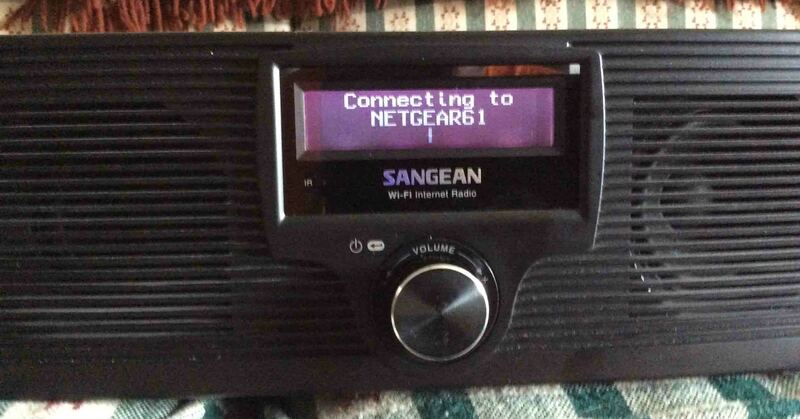 You have now successfully switched your Sangean WFR-20 Wi-Fi Internet Radio over to a new wireless network. Happy listening! 2018-02-24: Updated title, tags list, and Suggested Reading sections. 2018-02-05: Added a link to this radio’s picture gallery on this site.